LONDON--(BUSINESS WIRE)--Technavio’s latest market research report on the global maternity support products market provides an analysis of the most important trends expected to impact the market outlook from 2018-2022. Technavio defines an emerging trend as a factor that has the potential to significantly impact the market and contribute to its growth or decline. According to Technavio analysts, the global maternity support products market will grow at a CAGR of over 9% during the forecast period. The growing influence of fashion trends on maternity support products is a major factor driving the market’s growth. Maternity support wear constitutes an emerging segment of the global market. Online retailers have begun selling necessary products required during maternity period due to the increase in product awareness among women. But, the awareness among expectant mothers is generated through promotional campaigns on digital and social media, television advertisements, and other sources of information. Such practice by the vendors and online retailers has substantially influenced the purchasing decisions of expectant mothers or women who are planning their pregnancy. Modern women who are working and desire to spend on maternity apparel and support products are driving the demand for such products in the market. At present, the maternity support products such as maternity support gear, which includes support belts and belly bands and intimate wear such as maternity shapewear are sold by the vendors through online platforms. The growing number of tech-savvy customers who shop online and a rapidly expanding e-commerce industry will drive the online retail of maternity support products across the globe during the forecast period. Maternity wear is a niche category, which is witnessing improved product awareness and a significant year-on-year growth around the world. Vendors in the global maternity support products market are increasingly adopting the omnichannel strategy through which they sell their products through brick-and-mortar stores as well as through multi-vendor shopping portals that are hosted by third-party e-commerce retailers. “Evolving modern lifestyles, rising Internet penetration, increase in smartphone penetration, growing awareness of benefits of using maternity support wear are some of the driving factors, which will attract more customers toward online platforms to shop for maternity support products such as support belts, belly wraps, and shapewear. Besides, distribution channel expansion strategy will also contribute substantially to the total revenue of the global maternity support products market during the forecast period,” says a senior analyst at Technavio for research on retail goods and services. 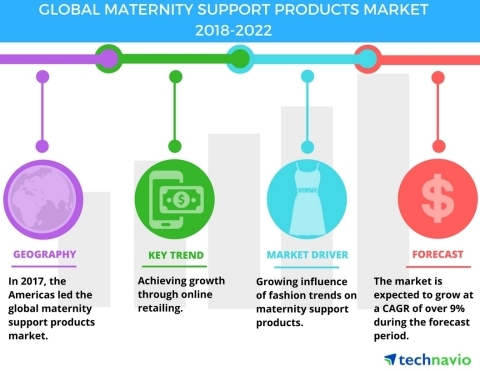 This market research report segments the global maternity support products market into the following products (maternity support wear and maternity shapewear) and key regions (the Americas, APAC, and EMEA). The maternity support wear segment held the largest market share in 2017, accounting for over 61% of the market. However, the market share for this segment is expected to decrease slightly during the forecast period. In 2017, the Americas was the market leader in the global maternity support products market, accounting for a market share of around 42%. Most of the market share was constituted by the US, Canada, and Mexico. EMEA and APAC followed the Americas as of 2017. Technavio’s new market research report on the global maternity support products market provides an analysis of the most important trends and drivers.